It is an undeniable fact that what you eat makes up what you really are. Around the world, governments are propagating the importance of healthy and nutritious eating habits. Among all the nutrients required by our body, one of the most important nutrients is beta carotene. It is a nutrient which is known for its power to boost our vision. Consuming beta carotene can provide a lot of many other benefits too. Let us first understand what beta carotene is and how it is beneficial for our skin, hair and health. What is Beta Carotene actually? Caretenoid is a naturally occurring pigment which is found in plants. It is a pigment which is responsible for giving vibrant colours to many fruits and vegetables. Carotenoids are found abundant in nature and are found in more than 500 different forms such as beta carotene, alpha carotene, cryptoxanthin, zeaxanthin and lutein. All these different types of carotenoids are distributed throughout the plant and algae world. Out of all these, beta carotene is something that is highly beneficial for human health. 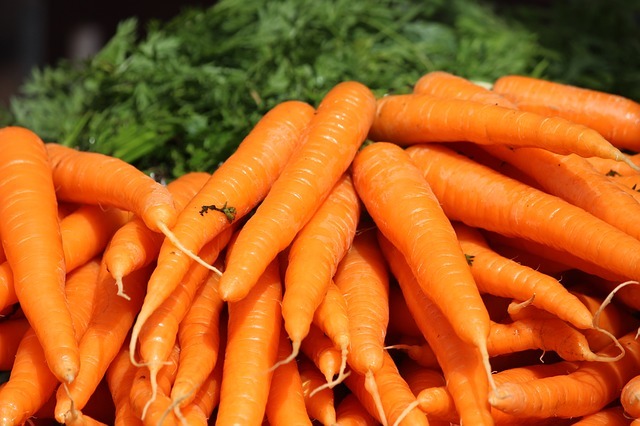 Beta carotene was first derived from the carrot roots and that is why it got its name from the Latin name for carrot. Beta carotene pigment is an organic compound. It is a hydrocarbon, and come specifically under the chemical classification of terpenoids. It is beta carotene which gives yellow and orange colours to various fruits and vegetables. This strongly coloured pigment gets converted into vitamin A when ingested. This vitamin A or retinol performs a lot of biological functions within your body. Vitamin A protects your cells from harmful effects of free radicals because of its antioxidant properties. How Beta Carotene is Produced? Beta carotene and many other carotenoids are also known as provitamin A. This is because of how it gets converted into Vitamin A in the body after it gets consumed you. For those who follow vegetarian diet, about 50 percentage of the vitamin A for the body is obtained from beta carotene and carotenoids. Beta carotene can also be produced synthetically from palm oil, algae and fungi. The importance of beta carotene comes from the fact that it is one of the important sources for Vitamin A, which involves in the formation of glycoprotein. These proteins are essential for the vision and can get subsequently converted into retinoic acid. These acids are important for various body processes such as cell differentiation and cell growth. For maintaining a healthy skin vitamin A is very important. And by now you know the role which beta carotene plays for vitamin A in our body. Let us see some of the important benefits of beta carotene for your skin. The anti-oxidant property of the beta carotene helps in preventing premature skin aging. It also imparts a natural glow to your skin and makes it more attractive and beautiful. But excess intake of this pigment will lead to making your palms, feet and white portion of your eye turn into pumpkin yellow colour. Consumption of beta carotene helps in boosting the effectiveness of sunscreens which you use. It also makes your skin less sensitive to sun rays. Consuming 90to 180 mg of beta carotene gives equal effect as that of SPF 4 sunscreen. Vitamin A is important for growth of hair cells. But high dose of vitamin A can lead to hair loss. Hence it is always better to go for food having beta carotene rather than going for vitamin A supplements. Beta carotene also helps in preventing problems caused by dry, dull and lifeless hair and prevents dry scalp and dandruff. It will also help in promoting hair growth. The health benefits of beta carotene come from its role in formation of Vitamin A which is essential for many bodily functions. Let us see some of the important health benefits of beta carotene. Beta carotene is found to be effective in delaying of brain cells. It can also reduce risks of dementia as it fights oxidative stress which can damage brain cells over time. Overall it is a real friend for your brain and can keep it young, healthy and active for a long time. Beta carotene is helpful in preventing diabetes. It has been found that people who are having high levels of beta carotene intake are less likely to have problems such as diabetes and impaired glucose tolerance. Macula is the part of the eye which is responsible for central vision. Age related macular degeneration (ARMD) is an age related disease that leads to break down of macula. Consuming beta carotene will help, along with other nutrients, in slowing down the process of macular degeneration. Having antioxidant properties, beta carotene can help in fighting cancer by preventing the growth of cancer cells. Regularly consuming beta carotene rich fruits and vegetables can keep you free from risks of having breast, colon, and oral cavity and lung cancers. Having large amounts of food containing beta carotene in your diet will help in increasing your lung capacity and will also relieve you from respiratory ailments. This will in turn prevent all sorts of breathing problems such as asthma, emphysema and bronchitis. Beta carotene works with Vitamin E in your body and reduces the oxidation of LDL cholesterol. This in turn leads to bringing down the risk of atherosclerosis and other coronary heart diseases. Hence following a diet which is rich in beta carotene can keep you away from cardiovascular diseases. Make sure that you consume fruits and vegetables rich in beta carotene. It is not something difficult to find as it is there in almost all fruits and vegetables which are green, yellow or orange in colour.